Advance tickets available at eventbrite and at the door. The Vista Room (7th floor) at The Park Lane, 200 Glenwood Drive in Monterey, is wheel-chair accessible. Monterey Peace and Justice Center Presents: Jazzniks and Peaceniks, a Concert Benefit. Join us for a lively mix of jazz performed by some of the finest musicians in the Monterey Bay Area. This musical event will take place in the scenic Vista Room on the seventh floor of The Park Lane in Monterey, with a spectacular 340º view of Monterey. Doors open 3:30 PM. Program begins 4:00 PM. Advance tickets are highly recommended. Includes beverages, hors d'oeuvres and desserts. ✴ PERFORMING ✴ Bob Phillips on piano, Bill Sullivan on bass, Roger Eddy on sax, Charles DeWeese on guitar,Mike Shannon on drums, Manuel "Macucho" Bonilla on percussion, andVocalists Lee Durley and Julie Capili. Enjoy music, delicious food, desserts, and drinks in the scenic Vista Room on the seventh floor of The Park Lane in Monterey, with its spectacular view of Monterey. 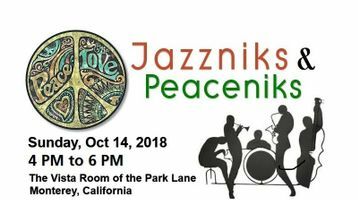 Proceeds from Jazzniks and Peaceniks will support the Monterey Peace and Justice Center in its mission to cultivate peace, nonviolence and social justice in our community and in the world by providing a community gathering place and resources for organizations advocating for social justice and human rights. Monterey Peace and Justice Center is a 501(c)3 non-profit organization.